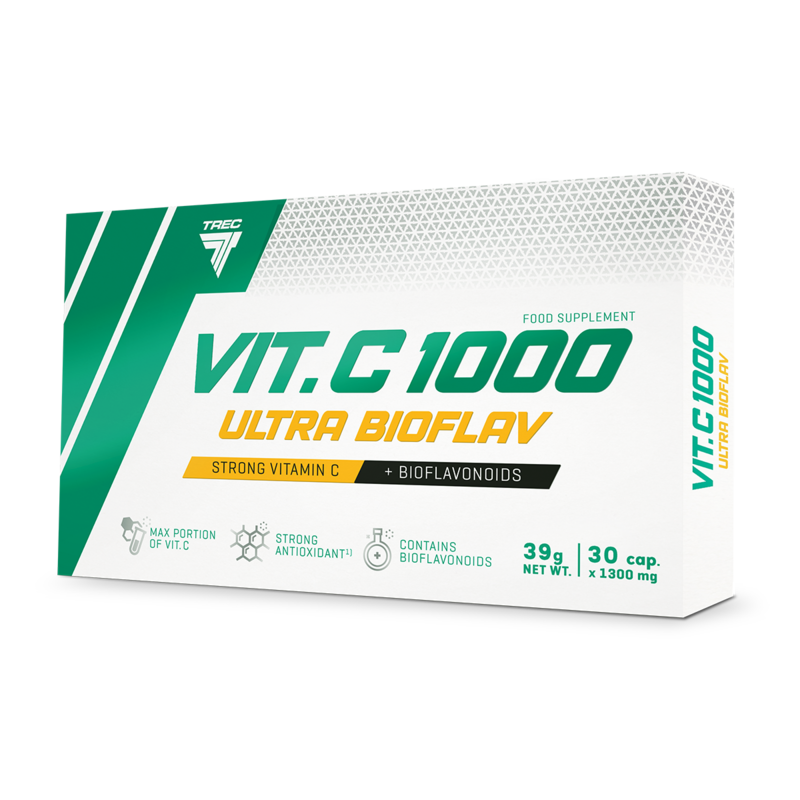 VITAMIN C 1000 ULTRA BIOFLAV is a product with increased content of vitamin C (1000 mg) and a complex of citrus bioflavonoids designed for athletes. Vitamin C contributes to maintain the normal function of the immune system during and after intense physical exercise. This vitamin also contributes to the protection of cells from oxidative stress. Take a single serving of the product ‒ 1 capsule with 300 ml of water. Take 1 serving daily, after the main meal. WARNINGS: Do not exceed the recommended daily dose. Do not use the product as a substitute for a varied diet. Children, pregnant or nursing woman must not take the product. Varied and balanced diet and a healthy lifestyle are important. Tartrazine, may have an adverse effect on activity and attention in children. Do not use large portions of vitamin C (over 500 mg) in people prone to kidney stones, or those with iron metabolism disorders. The product may contain allergens such as: milk, soy, wheat, barley, oats, eggs, peanuts and nuts. INGREDIENTS: vit. C (L-ascorbic acid) (77%); capsule shell (gelatine; colours – titanium dioxide, tartrazine); citrus bioflavonoids extract from bitter orange [fruit] (Citrus aurantium) [50% hesperidin] (8%); anti-caking agent – magnesium salts of fatty acids.